Use an email signature in Dynamics 365 Customer Engagement to save time and be consistent in your responses. The owner of an email signature can be a user or a team. Click Options, and then click the Email Signatures tab. On the Actions toolbar, click New. Owner: The user or team that owns this signature. Language: If you have multiple language packages installed, select the language for the signature you're composing. Title: The title for this email signature. Click Set as Default to make this the default email signature. If you have a default signature, when you create a new email in Dynamics 365 (for example, Sales > Activities > Email), an email signature is automatically added to the email based on the user you enter in the From field. An email signature must be defined for the user. To change or add a signature, click Insert Signature on the menu bar on an email form. When you open the Email Signatures page, email signatures you own are displayed. Change the view to All Email Signatures to see signatures created by others. The owner of an email signature can create, update, or delete it. 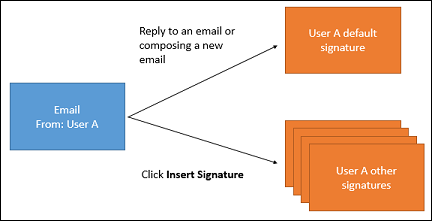 Each user or team can have no more than one default email signature. When you change the owner of an email signature, the signature reverts to non-default. For example, a signature is a default for user A. User A assigns it to queue X and queue X already has a default signature. The signature assigned will be non-default for queue X. If queue X does not have a default signature, the new signature will become the default signature. If the From field is changed to a user, the user email signature will appear. When you click Insert Signature, all the signatures that the user owns will appear. If the From field is changed to a queue, the default email signature of the owner of the queue will appear. The owner of a queue can be a user or a team. When you click Insert Signature, all the email signatures that are owned by the queue owner (user or a team) will appear. If the From field is changed to a queue, the default email signature of the owner of the queue will appear. The owner of a queue can be a user or a team. When you click Insert Signature, all the email signatures that are owned by the queue owner (user or a team) will appear.